On Saturday 16th next, Carrigtwohill United Under-13’s will hold a fundraising event in the Centra carpark in Carrigtwohill from 11am until 2pm. The squad are organising a soccer tour to England next Easter and this fundraiser will be in aid of this and your support would be much appreciated. 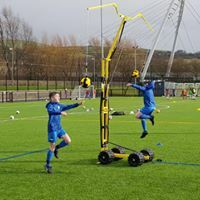 The fundraising event will involve the squad undertaking a ‘heading marathon’ using the Headrite equipment which has been devised to improve the heading technique of modern day players. Please come along and support this unique event.